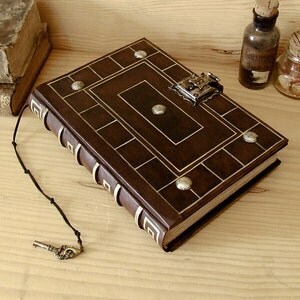 Antiqued Leather Journal with Lock and Key - "Secret Words"
I was so excited when this came in the mail. It was shipped very well and protected. There was also a very nice and lovely surprise for me in the package along with this journal. Teo made me a beautiful little journal with my name on the cover and it has a pretty design on it. 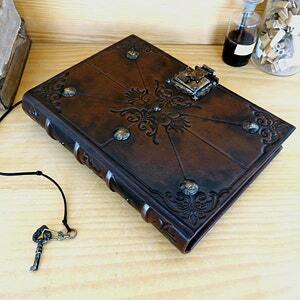 The Secret Words journal is a treasure and in fact all of the journals I bought from Teo are a treasure and will be family heirlooms too. Thank you so much Teo. I will always be grateful to you and your work. I highly recommend her journals. I promise you will not be disappointed. After the long wait (which was attributed to the holiday season traffic), the package arrived and I was just awestruck with this book for a time, I didn't realize three hours passed by and I was just holding it. 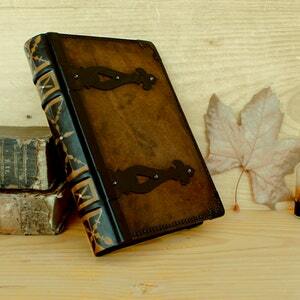 This vintage-looking journal/sketch book is sturdily made and the little imperfections such as those little cracks on the leather and the roughness of the page edges contributed greatly to the aesthetic antique feel. The pages are thick enough for watercolor renderings. The book looks great on either side, it was a task for me to pick which side would be the front. Evidently, Teo did not skimp on the quality materials to create this piece, and she was very pleasant and dependable the entire time of the email transactions. With all of these, I'm extending my thanks to Teo. 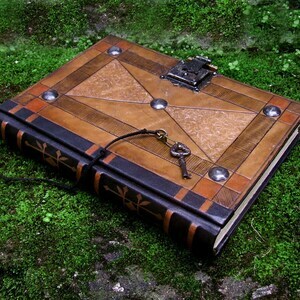 Journal with Lock and Key, Brown Antiqued Leather - "Spirit of Time"
I wish I could leave more stars. This book is absolutely GORGEOUS!!! It is a gift and if it wasn't for my son I would probably keep it. Thank you for your beautiful work and quick shipment. It arrived beautifully safe. Was fantastic - such a high quality, custom made book and made a fantastic present. Thank you! 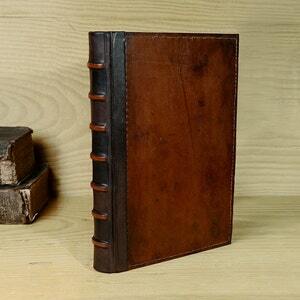 Leather Journal with Lock and Key, Brown-Yellow Antiqued Leather - "Moments"